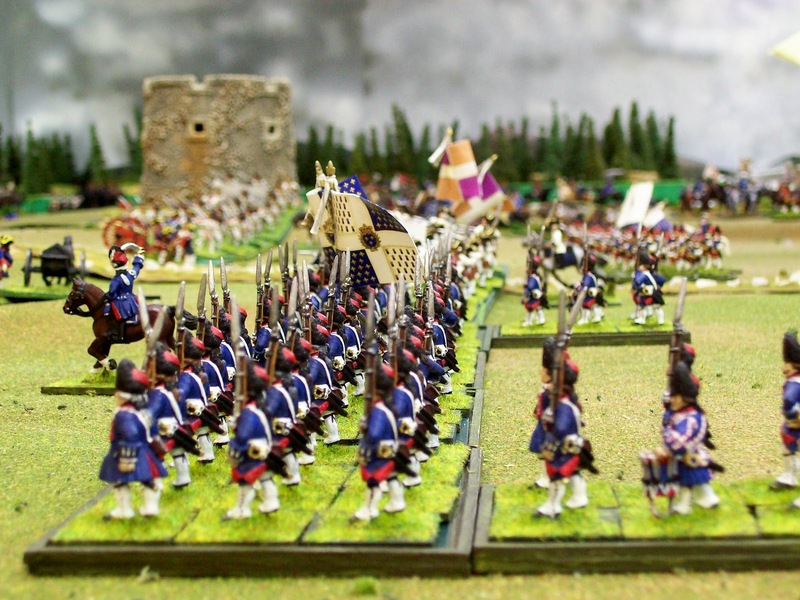 Charles Grant's Tabletop Teaser from Battlegames #23. Cavalry only, fast-moving using 100 cavalry per side. A 1.5 hour warm-up game before our main event. Almost four decades ago Don Featherstone suggested doing a cavalry only game. What if you don't have enough cavalry? If I remember correctly, Don suggested using cavalrymen from several different time periods. A very useful idea. Der Alte (Jim P.) suggested Korbach (fought 10 July 1760) so we could have our British and French tangle in Western Germania. 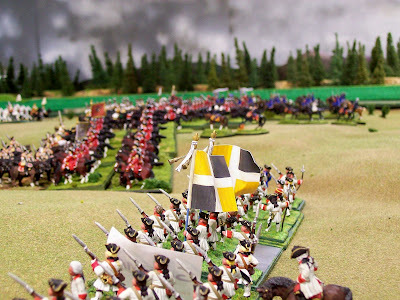 The table was based on the map on page 217 in my first edition of Sir Reginald Savory's, His Britannic Majesty's Army In Germany During The Seven Years War, published in 1966. A Watch Tower anchored the southern end of the Allied line in 1760 and in 2010. 2/Auvergne advances with shouldered muskets in the upper left while 2/Languedoc and 2/Guyenne (farthest away) approach the tower area. 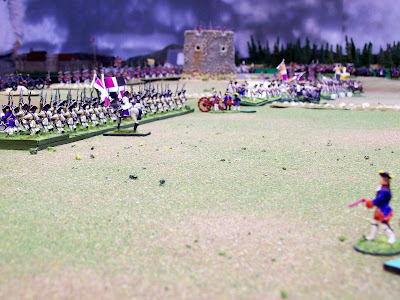 Note Britannian infantry in the tower. Barely discernible far far away a massive cavalry battle rages. Foreground: 2/Guyenne. Just beyond in red are resplendent Gendarmes. Some of the latter penetrated to the Allied Back Table pursuing and cutting down routing opponents. 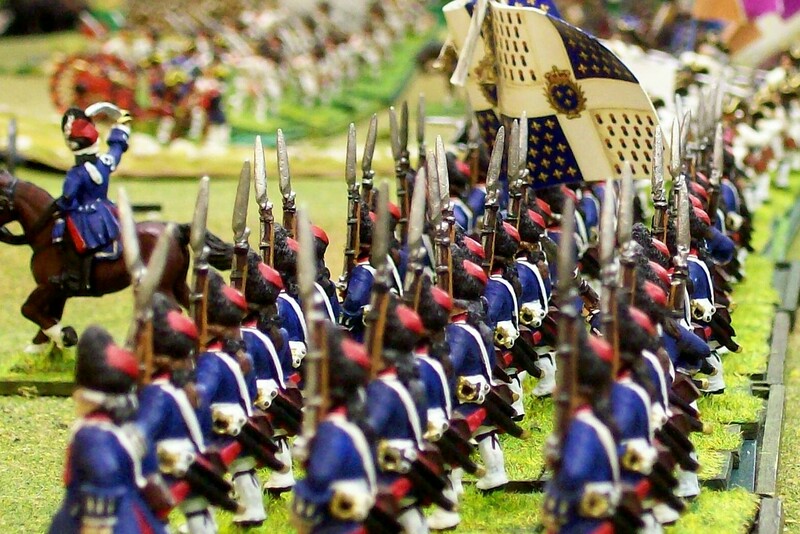 Late in the battle, two battalions of Grenadiers de France were committed from The Reserve. The near battalion marched between two separate Gallian batteries. There was insufficient room. As was customary, portions of battalions would pause, turn inward and march behind those not bothered by blocking terrain. 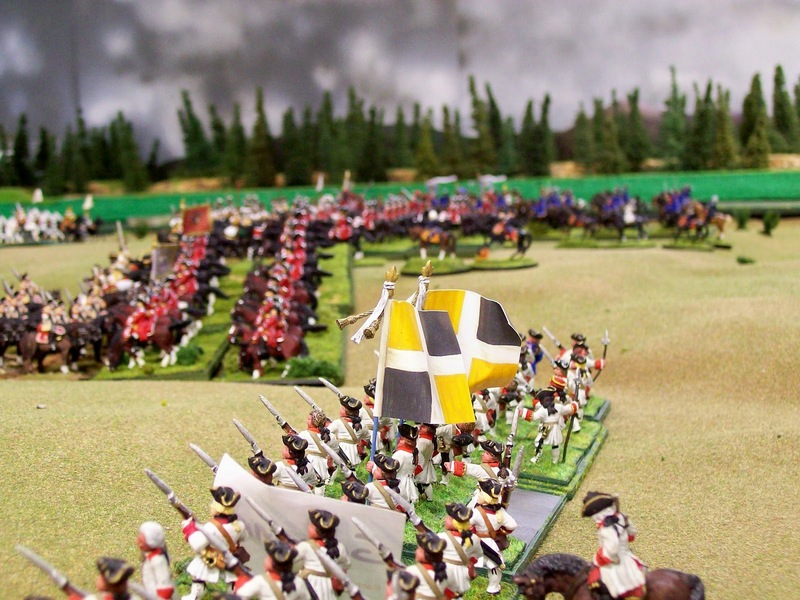 The grenadier (near) and picket (far) companies were the ones falling behind on this occasion. 1. Rules Batailles de l' Ancien Régime 1740-1763 known as BAR. 2. Miniatures On Table: 1,700 approx. 5. Tower made by H.G. Walls. 6. I did not take many photographs. Der Alte may post some he took on his blog. 7. To buy BAR and the recent edition of Savory go to the left of this blog finding the heading: Rules And Savory For Sale. To subscribe to Battlegames, click on the address at the upper left of the blog. 12 3rd Dragoon Guards (not guards). British: 2x6 Pdrs. and 1x12 Pdr. Hanoverian: 1x 4 Pdr. and 1x 12 Pdr.